I grew up watching my sisters volunteer to help others and often saw them inspire smiles on children’s faces through their work. Like a seed growing into a tree, the need to help those in need grew inside me. After being introduced to speech-pathology, I witnessed a number of communication problems that can prevent patients from connecting to other people through speech. Over the years I developed an interest in a specific population: children born with cleft lips and palates. Due to the limited number of cases that visited the university clinic where I worked, I started seeking other ways of helping patients. I started volunteering with an NGO that delivers medical and rehabilitation services to children born with cleft palates. My knowledge and skills grew as I worked on a large number of cases, my dream of becoming an expert in this field continued to grow as well. I applied for a scholarship through the Fulbright program to pursue my master’s in this field. The Fulbright Program educates people and equips them with the knowledge that they will later use to improve their home countries. Fulbright provided me with a golden ticket to reach my goal and fulfill the first step in realizing my dreams. Inspiring a smile on a child’s face puts an even bigger smile on mine. After I graduated with a Ph.D. in speech-language pathology, I decided to go back to my home country of Jordan to work as an educator and as a speech-language pathologist. 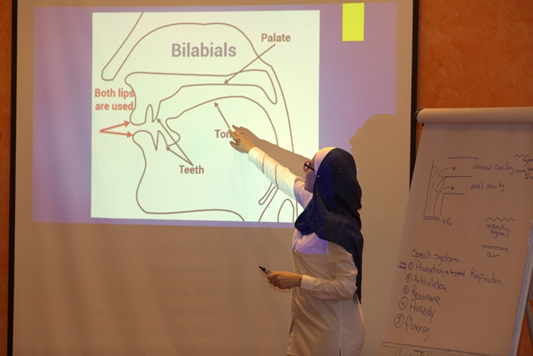 Since the field of speech-language pathology in the region and specifically in the Arab world is still progressing, there are only a few specialists in each area. In my specialty, cleft lips and palates, I am the only expert with a Ph.D. As prestigious as this singularity might seem, it also places a great deal of responsibility on me as a professional to train others and to spread the knowledge and skills I acquired through my studies with Fulbright. Through the years, I realized that conventional teaching methods might not be enough to prepare therapists to serve this population. I started thinking of a way to help practitioners build the skills they needed to better assess and treat patients. This is usually a very hard task especially for those with limited experience in handling children with cleft palates. I created a training program that combines all the skills I developed through my studies and professional career. It seeks to train speech-language pathologists, and the content is modified depending on the background of the participants and on how their skills grow over time. I started conducting the training in Jordan, and I have noticed a difference in the quality of services delivered. Teaching is what I was born to do. As I was training professionals, I started having a new dream. I started planning for a bigger goal of initiating a regional craniofacial center that could provide all the medical and rehabilitation services needed to help children born with craniofacial anomalies. The first step of this goal would be to found a group of qualified speech-language pathologists since they are an integral part of the multidisciplinary team that usually examines these children. Even though the creation of such a regional center will take time and effort, in the meantime, training speech pathologists who will train others in their communities is a big first step. Over the past three years, my second destination after my home country, Jordan, was Morocco. Getting the funding to conduct the training abroad was a challenging task. I was fortunate to win a Fulbright Alumni Community Action Grant, helping me to fulfill my duty towards my community and aiding me in reaching my goals. 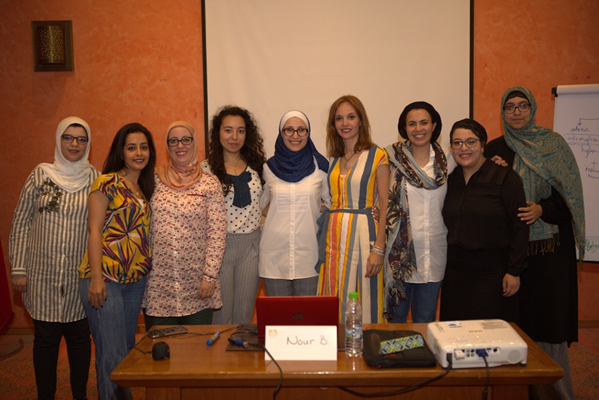 Using a semi-automated training workshop, I brought my training series to Morocco using auditory and clinical applications. I was blessed twice to have the Fulbright Program as the supporting pillar that I lean on when I need help. This encourages me to lend a helping hand to those who are hardworking and eager to learn but were not fortunate enough to continue their higher education. Responsibility comes with every privilege. Obtaining a degree or learning through experience is only one door that opens, and it is one’s duty to share knowledge and spread it. During my training, I meet so many dedicated professionals! Fulbright awarded me with funds to continue my pursuit of knowledge during my doctoral studies. But it also introduced me to so many friends and professionals from different parts of the world. Meeting people from different cultures and backgrounds is always an additional gift that comes with the Fulbright Fellowship. Nour is a former Fulbright student and completed her Doctorate in Speech-Language Pathology at the University of Florida in 2014. She is from Jordan.